When designing a hospitality center or working on a big project for a client, you need to create a look that your clients will love. Ideally, it should also be a style that will remain in fashion for years to come in order to provide your clients with the most cost-effective service. Art deco styling has been popular for several decades, especially in Miami, and it will continue to appeal to buyers for generations to come. Here are a few ways that you can mix the premium material of Bianco Dolomiti marble with an art deco look for a winning combination that your clients are sure to adore. There are so many benefits to going with monochromatic finishes, and it’s easy with the white color and subtle shading found in Bianco Dolomiti marble. Finishing a bathroom in an ocean of white from the floors and fixtures to the walls will make the space look and feel larger than it actually is. It’s easily transformed by the owners with the addition of a few decorative items, and it will work with almost any style of home. While this is one of the best options for small bathrooms that might feel crowded with darker colors, it’s also a great way to highlight the spacious layout in a larger room and make it even more impressive. Coordinate the hardware by going with a stainless steel finish that will bring out the gray contours in the tiles, and use glass shower doors to maintain the open, welcoming feel. Art deco style is all about making statements. One of the best ways to make your beautiful marble finish stand out is by surrounding it with sleek, contrasting colors like dark gray and even black. 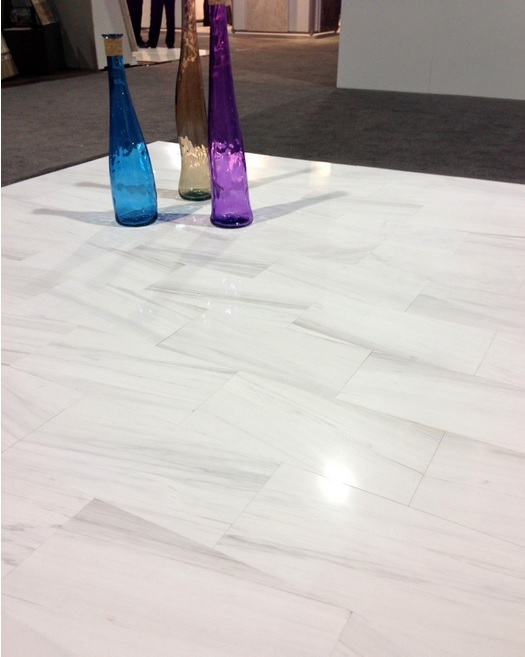 This brings out the veining in the marble and will add visual interest to any space. It also forces a visitor’s attention to key areas, such as the white counter tucked in between two black walls, or the white decorative shelving against a glossy black background. Combine the colors in areas like windowsills, countertops, and even floors. Use marble on the stair treads, but then line the risers with a sleek black finish for an amazing look that’s sure to make a great impression. You’ll add interest to the space while embracing the modern look that so many people love. If you love the idea of mixing black and white but don’t want to go with anything too bold, then simplify things with smaller tiles. Use a mixture of black and marble mosaic tiles to form an interesting pattern on the floor. Use larger tiles in either marble or granite to form a wide border around that central pattern. Finish the walls in a white or cream color, but use black generously throughout the space as an accent. It can be used to frame out a mirror in the bathroom, as the cabinets in your kitchen, or as an accent color on a wall in the foyer. You’ll love the finished look, and it will make a great impression on visitors and potential buyers alike. One of the best tricks to do with marble is to create a pattern using one simple color. By utilizing different tile sizes and shapes, you can add a visual texture to any large space. This is ideal for any large, open area where you want to add some visual interest without bringing in different colors or textiles. One very effective pattern that’s underutilized is the chevron. Made using long rectangular tiles, you create a zigzag that goes across the floor. Finish it out with a simple border to bring more attention to your chevron and help it stand out. Rather than setting your tiles in a simple checkerboard pattern, you can also turn them 45 degrees so that you have a diamond or harlequin pattern on the floor. Make the patterns stand out more by using grout that closely matches the gray shading in your marble. Not only will the pattern take center stage, but you also won’t have to worry about keeping brilliant white grout perfectly clean. You can create more interesting art deco patterns by going with a more drastic size difference between the white marble and black granite tiles. Choose large rectangles in white, and then install very narrow rectangles in a contrasting color at the ends. Set the tiles so that they’re staggered like a brick wall, and you’ll give the floor a fantastic stairstep pattern that’s sure to be a hit. You can also use the black granite at the corners of square tiles to break up the expanse of white and add a little touch of color to a floor. Rather than putting these fantastic patterns on the floor, you can also consider adding them to the walls of your shower, the backsplash in the kitchen, or along one wall in your entryway. When it’s time to create the floors and tile walls of your latest project, look beyond ceramic tile and consider Bianco Dolomiti marble. There are countless ways to use this material in your construction plan, and you’ll add an elegant look to the property with any of them. It’s very cost-effective to create art deco designs with marble when you work with the right supplier. Here at Nalboor, we strive to provide our clients with competitive wholesale prices on quality products. We pay close attention to detail to ensure that you receive the merchandise you need in a timely manner, and we offer excellent support throughout the process. We can supply you with everything you need from marvelous natural stone tiles in different sizes, shapes, and finishes to great products to help you take care of the tiles in the future. We take steps to keep our costs down, and then we pass the savings on to you so that you can enjoy excellent customer service with wholesale pricing. Contact us today to discuss your upcoming project and see which tiles will suit your purpose. Our friendly customer service representatives will help you place your order, and we’ll be here to assist you if you have any concerns once your shipment arrives. Your satisfaction is important to us, and we’re looking forward to helping you create the perfect art deco look for your project.